Andrew Hunn and Lloyd Clark’s Tasmanian entry Voodoo Chile opened their Aberdeen Asset Management Farr 40 Queensland State Title challenge convincingly with two bullets and ‘boat of the day’ pinned to the proud skipper’s chest. “We are in with a chance, but so are Transfusion and Kokomo,” said Hunn, very conscious that an early one point lead is a cushion, but by no means a comfy one for the southerners. Racing got underway close to two hours after the scheduled start. 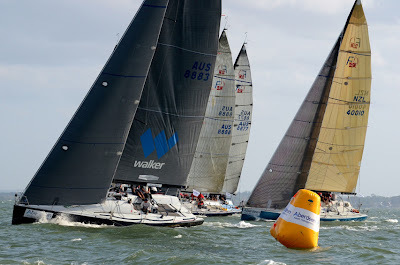 Given the 20 knot average sou’easter blowing on Moreton Bay proper, International Race Officer Louise Davis opted to hoist the AP (postponement) flag and keep crews ashore, a sensible decision backed by the five skippers. Davis then elected to shift the track from the western side of Green Island into Waterloo Bay, adjacent to Manly Boat Harbour, where conditions were calmer, winds in the high teens and seas less choppy. By the last race this afternoon a 13-15 knot ENE breeze and temperatures in the mid-20s made for genteel racing. Sort of. Voodoo Chile won race 1 and 2 from Guido Belgiorno-Nettis’ Transfusion (NSW) by a relaxed margin. In race 3 Belgiorno-Nettis decided second wasn’t good enough, tightening the screws to take the win by just two boat lengths. 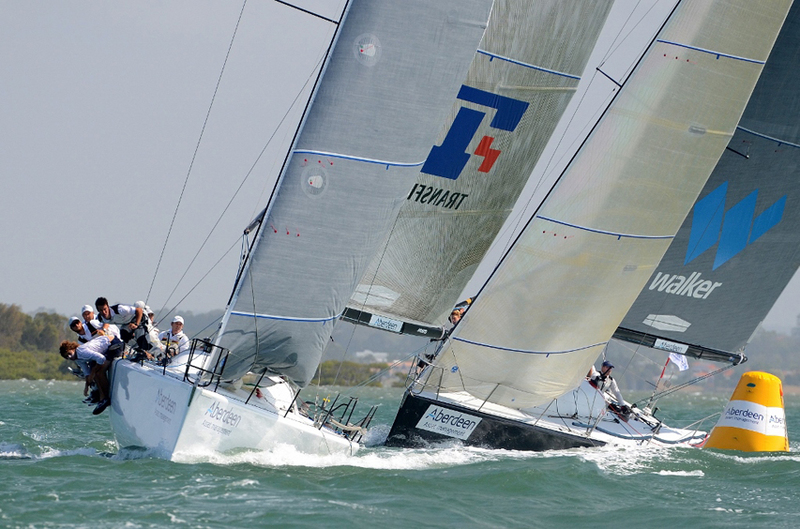 Transfusion’s tactician Mark Bradford knows the local waters well and the champion crew is going will vigorously defend their overall state win last year. Third in all three races was Lang Walker’s Kokomo from Sydney, none other than dual Olympic gold medallist Malcolm Page in the skipper’s ear as tactician. 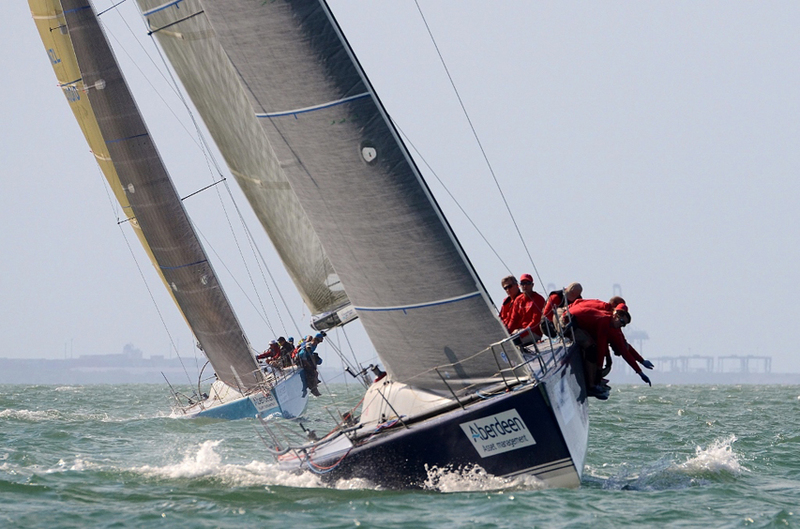 Another overcast Queensland state title tested the five crews representing three states, but Howard and David Lambourne, owners of Lambourdini representing the host club, Royal Queensland Yacht Squadron, got the real acid test. A broken backstay before the first race commenced had them rushing ashore to make repairs before the second start. “They were re-tensioning the rig as they were lining up for the pre-start,” said the IRO. In the second race they tore their kite on the first downwind run and in race 3 a poor bottom mark rounding cost them places and sent them to the back of the fleet. Crew reaction time was well and truly practised. As Lambourdini headed to the harbour for repairs a spare backstay was being rushed to the dock by one of David’s employees. A quick repair job complete, they headed back to the course where more misfortune lay in wait. When confirming David steered the boat today he did joke that, “at the moment you wouldn’t want me driving anything”. Tomorrow’s forecast, Saturday 26th October, is for a light five knot start building to 10 knots from the NNE. The three-day series will conclude Sunday 27th October.